Christmasville represents the premier novel in the Christmasville Trilogy and was awarded Finalist status in the Eric Hoffer, the Mom's Choice and the Next Generation Indie Book Awards. "In Christmasville," Michael imparts, "I wanted to achieve a seemingly simple, carefully tailored objective: I wanted to tell a story - as engaging for a sixteen-year-old as for a reader, sixty." The second novel in the trilogy, Finding Christmasville, was published in 2012 while the third novel, Saving Christmasville, is slated for publication in 2017. The author is currently writing the script for a graphic novel, Gamurai and the Feng Shui Sisters, which reveals the adventures and experiences of the sisterly duo as they attempt to remediate breaches, violations - indeed, crimes - of such offensive magnitude that all but the most mindlessly insentient would fail to register an assault upon their delicate, aesthetic sensibilities. Clam digger and construction worker; truck driver and warehouseman, controller, consultant and...Michael was employed in a wide variety of capacities. "I've never had what you would call a career but, rather, a compilation of disparate job functions. But only one provides me with any sense of accomplishment - and it isn't in the list above. 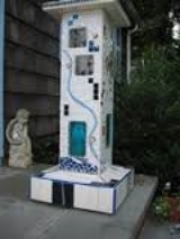 However..."
The "illumination pillar," fabricated of porcelain tiles, art glass, bisque masks and bits of jewelry by Stephen Albright and presented to his wife, Caroline, in Finding christmasville.